THE LEAD STORY – TRUMP, DEMS LOOK TO PLAY LET’S MAKE A DEAL: President Trump will meet with Democratic congressional leaders Chuck Schumer and Nancy Pelosi on Tuesday as both sides look to avoid a partial government shutdown before a Dec. 21 deadline … There are several items on the to-do list for Democrats and Republicans: A major farm bill; a formal rebuke of Saudi Arabia for the killing of activist Jamal Khashoggi; emergency funding for the deadly wildfires in California; a Republican-sponsored bill to extend expiring tax breaks and delay some health-care taxes; a bipartisan criminal justice reform bill; a bill to protect special counsel Robert Mueller; a plan to overhaul the system for handling sexual harassment complaints on Capitol Hill. However, Trump’s long-promised border wall will be the biggest obstacle. 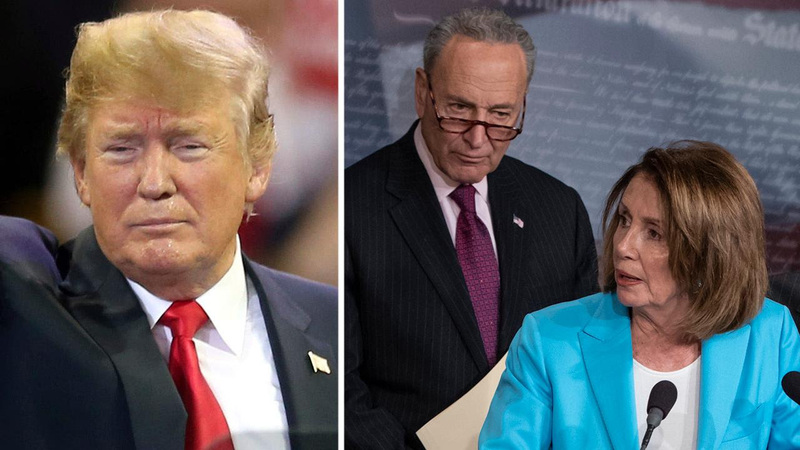 The president wants the next funding package to include at least $5 billion for the wall with Mexico, a proposal Democrats have rejected. MANAFORT HEARING: Special Counsel Robert Mueller’s prosecutors and attorneys representing former Trump campaign chair Paul Manafort will appear at a status hearing Tuesday in a step toward deciding whether Manafort violated his plea agreement with Mueller … Mueller’s team wrote in a heavily-redacted Friday court filing that Manafort violated his plea agreement by making false statements to federal investigators, including about his contact with Trump administration officials as well as information pertinent to an undisclosed Justice Department investigation. BREXIT CHAOS: The status of Brexit appears to be unclear after British Prime Minister Theresa May on Monday delayed a vote in Parliament to approve her controversial deal … The move that presents an uncertain path ahead in Britain’s lengthy divorce from the European Union. European Union official Donald Tusk says the bloc won’t renegotiate the Brexit deal with the U.K. government as he called a summit Thursday to examine ways to help Britain ratify the deal. EU leaders were already scheduled to meet in Brussels on Thursday and Friday to discuss migration and the bloc’s future long-term budget, among other issues. EXCLUSIVE: JARED KUSHNER SPEAKS OUT – In an exclusive, rare interview, President Trump’s son-in-law and senior adviser Jared Kushner told FOX News’ Sean Hannity that, despite increasingly critical media reports on the Trump administration and his role in it, the White House is humming along effectively as new officials prepare to take over top roles … Kushner insisted that day-to-day White House operations aren’t affected by what he called media “noise,” and pointed to the news that the U.S. this week became a net oil exporter for the first time in 75 years. Academy Awards considers going without host after Kevin Hart controversy: report. Stock futures point to giving back some of Monday’s gains | Vicious cycle. Wall Street Journal: CBS directors fear legal risks from leaks in Moonves probe. Hundreds of generic drugs at center of probe into ‘largest cartel’ in U.S. history. Verizon buyouts: 10,400 employees accept severance offer. FOX & Friends, 6 a.m. ET: Kenneth Matlack, an Oregon sheriff, talks about the state governor’s budget to sue Trump and defend illegal immigrants; Tom Kersting, a family therapist, talks about the effects that TV time has on your children; Judge Andrew Napolitano, FOX News’ senior judicial analyst, on the Mueller investigation; Michael Anton, a former deputy national security adviser; Tom Shillue, a comedian and FOX News contributor, tests the hosts’ Christmas song knowledge. Rev. Franklin Graham, the president of Samaritan’s Purse. The Story with Martha MacCallum, 7 p.m. ET: Robert Zimmerman, a longtime Democratic consultant. Tucker Carlson Tonight, 8 p.m. ET: Guests include: Tammy Bruce, columnist and syndicated radio host, and Business Insider’s Daniella Greenbaum. Hannity, 9 p.m. ET: Gregg Jarrett, FOX News legal analyst; Jesse Watters, co-host of “The Five”; and Jessica Tarlov, a FOX News contributor. Mornings with Maria, 6 a.m. ET: Special guests include: U.S. Rep. Jim Jordan, R-Ohio; Ben Phillips, EventShares chief information officer; U.S. Rep. Debbie Dingell, D-Mich.; John Browne, former member of Britain’s Parliament. Cavuto: Coast to Coast, Noon ET: Ed Tilly, chairman and CEO of Cboe Global Markets, Inc.; U.S. Sen. Bill Cassidy, R-La. Countdown to the Closing Bell with Liz Claman, 3 p.m. ET: Terry Duffy, chairman and CEO of CME Group. The FOX News Rundown podcast: On Monday, the Supreme Court declined to hear a case brought to the court by states seeking to stop Medicaid funding for Planned Parenthood services and other private health organizations. Bill Mears, FOX News’ Supreme Court producer, breaks down the story. Louisiana Attorney General Jeff Landry and a representative from Planned Parenthood will also weigh in. Plus, Democrats officially take control of the House in 2019, ending one party rule of Congress for the first time in eight years. House Majority Leader Kevin McCarthy, R-Calif., joins the podcast to explain what he expects and why he’s hopeful. Plus, commentary by author and former executive assistant to president Ronald Reagan, Peggy Grande. The Brian Kilmeade Show, 9 a.m. ET: The latest on the changes in the Trump administration and Special Counsel Robert Mueller’s investigation will be discussed with Marc Lotter, former special assistant to President Trump; Allen West, former Florida congressman; Jason Chaffetz, FOX News contributor and Chris Stirewalt, politics editor at FOX News. 1991: A jury in West Palm Beach, Fla., acquits William Kennedy Smith of sexual assault and battery, rejecting the allegations of Patricia Bowman..
1980: The TV series “Magnum P.I.,” starring Tom Selleck, premieres on CBS.